Sharing Low Carbon Electricity between the Pacific Northwest and California. Resource Adequacy – What Is It and Why Should You Care? On February 15, FERC issued Order 841 to remove barriers to the participation of electric storage resources in the capacity, energy, and ancillary service markets operated by Regional Transmission Organizations (RTO) and Independent System Operators (ISO). The Order solidified FERC’s commitment to opening the nation’s wholesale markets to distributed storage. The FERC push has been lauded by many as landmark, a “lifting of the floodgates” for energy storage. Building on this momentum, FERC will host a Technical Conference next week to further their progress, focusing this time on the integration of technology-neutral aggregations of distributed energy resources (DERAs). FERC’s leadership is a welcome turn of events. But while FERC steams ahead, it must consider local regulations, markets, and conditions which may be make or break for distributed energy resources. A FERC led integration of DER into wholesale markets is a good thing, but their requirements should avoid a “one size fits all” approach misaligned with local conditions. With this objective in mind, we highlight three dimensions to DER wholesale integration where careful balancing of federal and local policy are required: grid operations, DER business models, and impact on emissions. 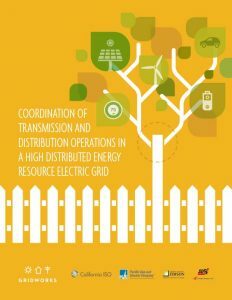 Coordination of Transmission and Distribution Operations in a High Distributed Energy Resource Electric Grid. First, interconnecting resources at the distribution level while dispatching them at the wholesale level — so called “tier bypassing” — introduces grid operations challenges that must be managed. The Gridworks paper on DER integration into wholesale markets, which was the culmination of months of ruminating on these challenges by California grid operators and distribution utilities, gives insight on these challenges and potential solutions. (This paper has been webinared, podcasted, and profiled for your convenience.) One key takeaway from that paper: “outages and abnormal circuit configurations can create capacity constraint conditions on a distribution grid, which in turn affect a DER’s ability to participate in wholesale energy markets.” In other words, don’t forget that the wire you’re connected to needs to be physically capable of supporting wholesale participation and that wire isn’t controlled by, or even visible to, the wholesale market operator. What happens when the wire isn’t up to the job? RTOs/ISO need to consider this question in concert with their local distribution operator counterparts. The answers they uncover will almost certainly differ from jurisdiction to jurisdiction. How to account for and resolve this challenge requires coordinated, complementary FERC and local policies. Second, there are a range of business models for DER integration into wholesale markets. Two primary models are participation as demand response, in which no power is injected into the grid, or participation as a non-generator resource, in which power is injected. The focus of the Technical Conference appears to be the latter. It should be acknowledged that in California actual participation of DER under the non-generating resource model has been limited to single-units and there are no participating DER Aggregations. Aggregators who would participate on this model have stayed on the sidelines, choosing instead to participate as demand response (only). One reason for this is in California has been storage resources have prioritized service to the host customer, especially demand charge mitigation, over wholesale market opportunities. The point here is that the way a DER participates in the wholesale market may vary and a “one size fits all” approach may unduly limit that participation. Further, business models for successful DER integration will be heavily impacted by local conditions such as retail rate design. This challenge is a second reason for FERC to leave plenty of space for local varieties of DER integration. Finally, will a DER’s participation in wholesale markets reduce GHG emissions? A recent CPUC evaluation concludes energy storage resources under it’s Self Generator Incentive Program actually contributed to emissions and system peak. Whether a storage resource reduces emissions depends on the carbon intensity of the power it takes, round-trip efficiency of the battery, and the power it displaces when injecting back to the grid. Will these factors naturally align with the least cost dispatch of the wholesale market? Will this outcome vary from RTO to RTO? This is a third area where FERC’s policy-making may wish to leave room for local conditions to effect dispatch choices. What do these three dimensions have in common? They require a delicate balance between FERC and local leadership. While FERC can and should forge ahead, it should do so with careful consideration and coordination of local conditions. Gridworks’ mission is to convene, educate and empower stakeholders working to decarbonize electricity grids. Since 2010, Gridworks (formerly known as “More Than Smart”) has enabled this mission through four strategies: by identifying high-value challenges to decarbonizing electricity grids; convening stakeholders and providing them neutral ground, technical support and facilitation to identify break-through solutions to identified challenges; publishing and helping implement identified solutions; and adapting successful solutions to new markets. Join our efforts at https://gridworks.org/join/. This entry was posted in Matthew Tisdale, Uncategorized. Bookmark the permalink.